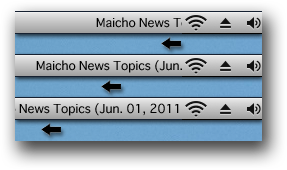 The most up-to-date news is delivered to your menu bar in a manner of electric bulletin board. Any RSS can be chosen as a news source. News containing your favorite words can be delivered with an alert sound and those with unpleasant words can be eliminated. Your timeline can be displayed. By registering RSS, the most up-to-date news is successively obtained and displayed in a manner of electric bulletin board. To proceed to the details, click the news title displayed. Both your Twitter timeline and the results of the Twitter search, from any words, can be displayed. The news containing the preset words are emphasized by blinks and alert sounds, which help you not overlook any news you are interested in. The news containing the preset words are eliminated from the display, which help you skip all the news you are not interested in. The noodle timer gives an alarm sound after any minutes preset. The display speed of a telop and the area of the animation can be arbitrarily set. News will be floating from right to left after application starts. The display area is iconized by the current status. When the Internet connectivity is the off-line. When the user has not selected "On-line". The menu appears when clicking the display area. 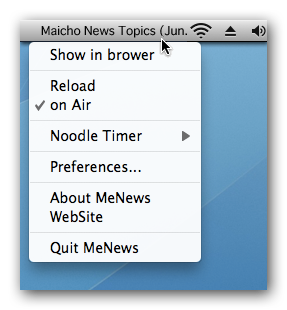 Details of the news currently displayed on the menu bar appear on the web browser. The news currently displayed can be reloaded. Time to sound the alarm is selected from the submenu items. A small clock icon is displayed in the menu while setting the alarm. The alarm rings when time comes. The alarm is stopped when clicking during playback. Application credits will be shown. Preferences panel has General, News and Twitter tabs. *It doesn't be displayed if the display area is too wide. When the display area is not able to be secured to a menu bar, the area is reduced automatically. Changing the number of times of a display of each article. Switching the beep sound on/off. If this is selected, MeNews starts automatically when the computer starts. The source URL of RSS is registered. The news article is acquired from registered URL and displays it. 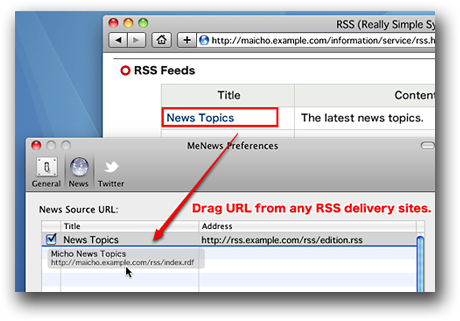 How to add the source URL of RSS. Open Preferences panel and select News tab. Please open the site of the target that you want to RSS by your web browser (e.g. Safari). Drag the link including URL of RSS that wants to display to the list box. Input an arbitrary name to the title column, if necessary. Drag the row in the listbox when you want to change the order of the display of news. You can select/unselect of news is switched. Press delete key. After select the row which you want to remove RSS in the listbox. News that the word is being included isn't displayed. Delimit it in space when you set the plural. News that the word is being included is blinked. Delimit it in space when you set the plural. If you don't save the password, the getting timeline is automatically turned off when this application will be restarted. You can change the max of results. *This application doesn't support multi account of Twitter. If some words are entered, you will get the result of Twitter Search. You can change language and the max of results. Changing the display item of a tweet. It doesn't be displayed if the display area is too wide. It's reset to the minimum size if overflowing. This application doesn't support multi account of Twitter. It is necessary to be connected with the Internet to acquire RSS. I have used OAuthConsumer in this application. I have used SBJson in this application. I have used NetworkReachability in this application. We will take no responsibility for any troubles and losses that may be caused by the use of this application.